Cyclones maintained a similar starting line up to that of previous games, with the squad starting to gel the consistency would be key against Raptors. The game started well with Cyclones taking a 5-2 head start, but slowed as Raptors started to make things difficult with aggressive front defence and the score was levelled at 5-5. The team dug deep to pull a small lead and enter the break at half-time at 10-8. Substitutions were brought on in the form of Alice Hunter and Liam Pattison, who made an immediate impact in attack scoring a goal apiece and the first two goals of the second half to extend the lead to 12-8, with Alice bagging a further goal later on. Not wanting to rest on their laurels, the team set about racking up the score, with the girls playing a phenomenal role in contributing two thirds of the goals. Ellie Johnston down one end and Kiera Evans down the other worked their players to score 11 open play goals between them, both from distance and attacking the post. For their efforts, Ellie was rewarded with the opposition’s MVP nomination at the end of the match, whilst Kiera Evans took the player’s player vote. Matt Morgan took centre stage to top score for the boys with 4 goals, calmly putting away a handful of penalties and adding to them with a couple of shots from the outside, and was roundly backed up with a goal apiece from the other boys. This was a game where defence was all important for them; with Raptors scoring 100% of their goals through their boys, it is testament to their focus that they managed to neutralise some players who have been considerable threats in recent games. With Leo Comerford scoring 11 against Farnborough, and Will Hayward bagging 8 against Thunder 2, these were dangerous players to confront. Niamh Sully enjoyed her first game against her old club, scoring two sublime goals and creating numerous chances for her teammates. Niamh is evolving into a leader on the pitch and her ability to motivate her team mates was all-important in this match. Down the other end, Izzy didn’t manage to continue her scoring streak but played phenomenally well to ensure the game-plan was executed in attack and defence. What started as an edge of your seat affair ended with a cruise to victory as Raptors took off their starting players towards the end of the match; if they had scored as many from their girls as their boys then the game would have been a much tighter one. 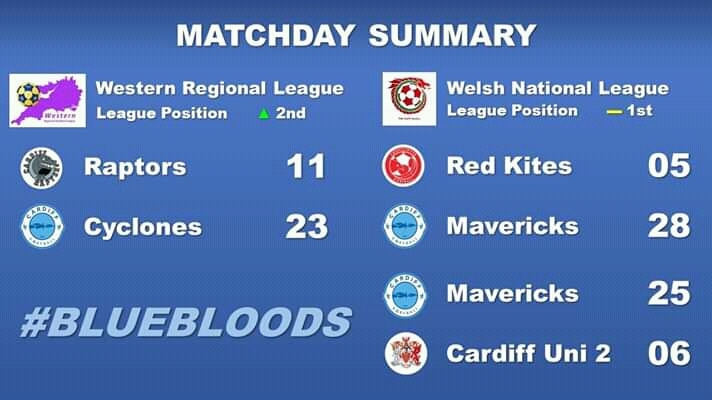 As it was, Cyclones took the honours with a 23-11 victory to move temporarily into second place in the league.